On 29 March 2018, I visited Valence House Museum in Dagenham, Essex, just outside London, England, to see a wonderful exhibition entitled 'Dinosaurs, Harryhausen and Me', which featured a sizeable number of the iconic, world-famous dinosaur and monster models created by the legendary special-effects genius Ray Harryhausen and appearing in a number of his celebrated Stop-Motion science-fiction and fantasy movies, including Jason and the Argonauts (hydra, two fighting skeletons), The Valley of Gwangi (Gwangi, Styracosaurus, Eohippus, Ornithomimus, Lope), Clash of the Titans (Pegasus, Medusa, Bubo the living mechanical owl), Mysterious Island (giant ammonite/nautiloid mollusc), One Million Years BC (Ceratosaurus), and First Men in the Moon (Grand/Prime Lunar – the big-brained leader of the moon-ruling insectoid Selenites). The 'Me' in the exhibition's title is none other than a longstanding Facebook friend of mine, expert model maker Alan Friswell, who was personally appointed by Ray to restore all of his priceless models, as some had suffered damage and wear during the 40+ years since they had originally been made. 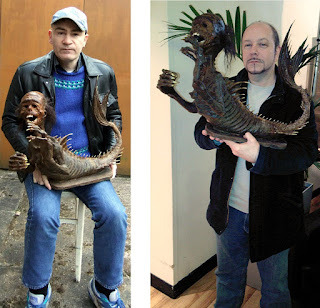 Alan also very kindly made for me a wonderful full-sized Feejee mermaid that I greatly treasure – thanks Al! 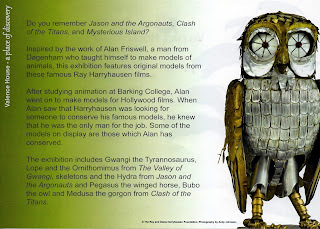 As Alan is local to Dagenham, the Museum was very keen to stage the exhibition, which is proving extremely popular, and it was an absolute delight for me to view at first hand so many of the awesome creations that captivated me on screen when I first saw their films as a youth and which still do when I rewatch them today. A selection of framed artworks produced by Ray is also on display here, together with some of Alan's own stunning models. 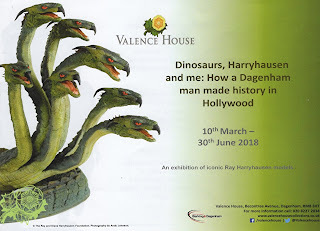 Alan is to be heartily congratulated upon organising such a captivating and thoroughly unique exhibition in England, which lasts until 30 June 2018, and even has free entry, so do try and visit, especially if, like me, you're a lifelong Harryhausen fan. Highly recommended!! This is my all-time personal favourite of all of Ray's many marvellous creations – El Diablo, the little prehistoric Eohippus that features in Ray's spellbinding Western/sci-fi movie The Valley of Gwangi (1969). The stupefied reaction of the movie's scientist character, Prof. Bromley (played superbly by the highly-respected English character actor Laurence Naismith) upon seeing El Diablo, and referring to him as the greatest scientific discovery of the age, was a major cryptozoological incitement to me at the tender age when I first viewed this fantastic movie. Click here to view the classic footage that introduces El Diablo in it. Incidentally, although when I was a child this ancestral equid (from the early Eocene, c.50 million years ago) was indeed referred to zoologically by the iconic name Eohippus ('dawn horse'), it was subsequently renamed Hyracotherium (a much duller, far less evocative monicker, in my opinion), due to the strict, inflexible rules of nomenclatural precedence (it appeared that the latter name had been assigned to it prior to Eohippus). Happily, however, it is now Eohippus once more, because the genus Hyracotherium has lately been shown to be a paraphyletic hotchpotch, an artificial assemblage of various unrelated forms. So, welcome back, little dawn horse, you've been greatly missed! 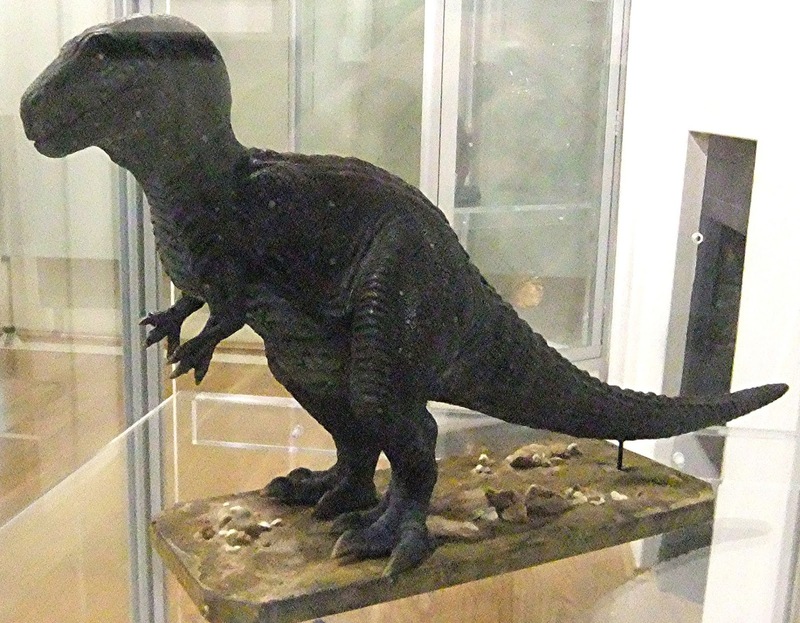 Although Gwangi was officially described as a Jurassic Allosaurus, Ray Harryhausen freely confessed that he had also been inspired by the latter dinosaur's Cretaceous descendant Tyrannosaurus rex when designing its model, combining elements from both forms to create a truly terrifying theropod that wreaked havoc and mayhem when hauled out of its prehistoric valley enclave into the modern-day realm of humanity. Ray was famed for the incredibly life-like, realistic appearance of his creations when seen on screen, due in no small way to the myriad of small but highly individualistic behavioural nuances with which he imbued all of them. For me, this is epitomised by the scene from The Valley of Gwangi in which a friendly performing circus elephant is suddenly confronted, attacked, and mercilessly slaughtered by a rampaging, newly-escaped Gwangi. Despite knowing full well that the elephant, just like Gwangi, was actually a Stop-Motion model, not a real elephant, it was thanks to Ray's genius in animating it so realistically that when I viewed this film for the first time as a teenager I was thoroughly traumatised by its savage death at the claws and teeth of Gwangi, and even today I always find that particular scene difficult to watch. Testament, indeed, to Ray's astonishing cinematic skills! If you care to watch it, click here – but don’t expect me to! El Diablo and Gwangi are not the only prehistoric creatures featuring in The Valley of Gwangi. In addition to a pterosaur (almost obligatory in a movie of this nature), there are also an Ornithomimus and a Styracosaurus. Relatively small and fast-running in bipedal mode, the Ornithomimus ('bird-mimic') is being swiftly pursued by an astonished trio of cowboys on horseback within the mysterious valley when abruptly the hitherto-concealed Gwangi bursts into view, leans down, neatly snaps up the hapless bird-mimic dinosaur in its great jaws, and begins feeding upon its still-twitching body. Not surprisingly, the cowboys duly choose discretion as the better part of valour, and ride away very swiftly in the opposite direction – although one of them does turn around briefly and fires a couple of ill-advised shots in the great reptile's direction, before racing off again when a menacing, totally-uninjured Gwangi makes it abundantly clear that it does not take kindly to its meal being disrupted in such an impolite manner! Click here to view this tense, electrifying scene. 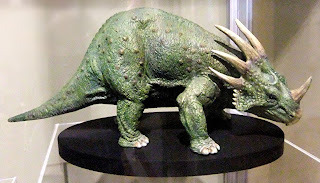 The Styracosaurus, conversely, is made of sterner stuff, because when it is attacked by Gwangi a little later in the film, it soon puts its long and very formidable sharply-pointed snout-horn to effective use, fending off Gwangi with fierce thrusts to the latter's underparts – until cruelly betrayed by a group of cowboys keeping watch from a safe distance. Planning to capture Gwangi alive for exhibition purposes, they treacherously collude in its attack upon the Styracosaurus, their leader Carlos spearing the horned dinosaur in order to weaken it, thereby enabling Gwangi to overcome its defensive manoeuvres and kill it. Click here to watch this literally monstrous scene of treachery and tragedy! Loosely based upon the Jules Verne novel The Mysterious Island (1874), this classic Ray Harryhausen movie from 1961 features a host of giant mutated creatures as well as some prehistoric survivors. 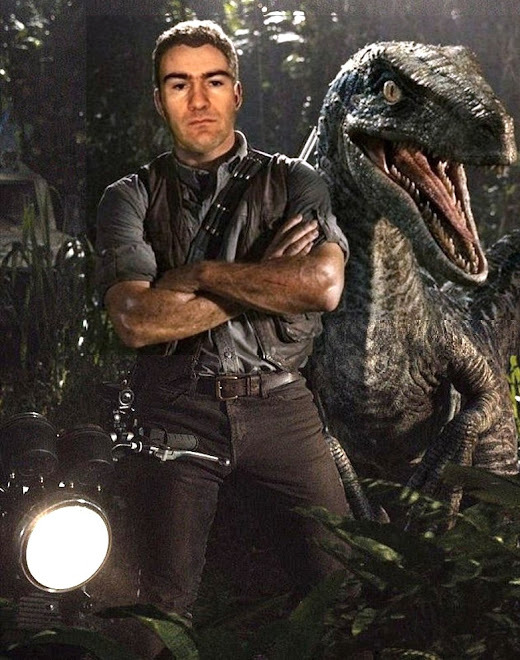 Most famous of these latter is a terror bird Phorusrhacos (although many film-goers mistakenly assumed that it was simply a giant chicken! ), but also present is this awesome giant ammonite (or nautiloid, according to some sources). Another of my favourite if lesser-known Harryhausen creations, this gargantuan marine mollusc appears near the end of the film and furiously battles the heroes during their valiant attempt to escape the island by raising from the deep a sunken but otherwise seaworthy pirate ship. Click here to view the dramatic underwater scene in which it appears. At one time or another, virtually every major taxonomic group of prehistoric animals has been cited as a possible identity for some cryptid, but as far as I'm aware no such mystery beast has ever been likened to a living ammonite or a living fossil-type nautiloid. Today, the nautiloids are represented solely by the handful of pearly (chambered) nautilus species. As for the ammonites: constituting a discrete subclass within the molluscan class Cephalopoda (containing today's octopuses, true squids, cuttlefishes, nautiluses, and vampire squid), the ammonites were once a dominant group within the prevailing marine fauna, but their last representatives died out during the mass extinction at the end of the Cretaceous, c.66 million years ago…didn't they? Based upon the eponymous sci-fi novel by H.G. Wells from 1901, in which some eccentric Victorian-era English scientists successfully travel to the moon (i.e. many decades before America's real-life Apollo missions), this delightful British movie from 1964 features some of Ray's most distinctive creations, including giant caterpillar-like mooncalves, and the insectoid ruling lunar race, the Selenites, whose leader is the grotesquely big-brained Grand (aka Prime) Lunar. Click here to view them in an original 1960s trailer for this film. The concluding section of the movie shows the purported first-ever manned landing on the moon, in 1964, by a team of UN scientists, only for them to discover that the English scientists had long ago beaten them to it, and had left their leader, Prof. Cavor, behind there at his request. He now was dead, but so too was the entire Selenite civilisation, victims of the common cold viruses that Cavor had inadvertently brought with him from Earth. Needless to say, this closely echoes the famous denouement in an earlier H.G. Wells novel, The War of the Worlds, in which the seemingly unstoppable Martians invading Earth are ultimately overcome not by the might of humanity, but rather by our planet's tiniest inhabitants, the viruses, against which the Martians have no defence. Ray's last but also his technically greatest film was Clash of the Titans (1981), a breathtaking mythological melange of a movie in which strands and characters from a number of different classical legends are deftly woven together to create a thrilling storyline that loosely centres upon the dramatic saga of the Greek hero Perseus and his daring rescue of the princess Andromeda from a horrific sea monster. The winged horse Pegasus, ridden here by Perseus during his ultimately successful bid to save Andromeda, didn't actually feature in the original version of this particular legend – instead, Perseus had been equipped with winged sandals presented to him by Hermes, whereas Pegasus had borne an entirely different hero, Bellerophon, during his battle with the monstrous Chimaera. Nevertheless, Pegasus's inclusion provides a truly scintillating additional spark of movie magic to what is already a spellbinding, highly suspenseful tale of monsters and mystery, and which even incorporates a Nordic interloper in the shape of the Kraken, no less – or at least its name, which is understandable, given that the Greek sea monster's original name, Cetus (from which 'cetacean' is derived, the formal zoological term for all whales, dolphins, and porpoises), would certainly have been far less dramatic or memorable to movie-goers. Ray was once asked where he had derived his inspiration for choreographing and animating Pegasus in flight, as it seemed so natural, so realistic. In reply, he revealed that he had consulted what he personally considered to be the finest source in existence relating to such matters – namely, the idyllic scene from Disney's immortal animated film Fantasia (1940) that features a phalanx of winged horses flying through the sky before spiralling downwards to land gracefully upon a pastel-hued lake like a flock of equine swans (click here to view this enchanting scene – one of my all-time favourite animated sequences, set to the lyrical theme arising midway through the third movement of Beethoven's Pastoral Symphony). Additionally, click here to view a short documentary segment featuring Ray talking about how Pegasus was designed for realistic flight, and also including some excerpts from Clash of the Titans featuring the winged steed in action. 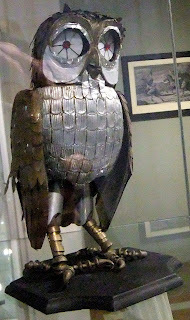 Also appearing in Clash of the Titans is Bubo, a living mechanical owl created from brass and iron by the fire god Hephaestus as a metallic replica of the real Bubo, the wise pet owl of Athena, goddess of knowledge and wisdom. Its function, as dictated by Zeus, the supreme Greek god and also father of Perseus, is to lead Perseus to the Graeae or Grey Sisters (aka the Stygian Witches), who, albeit only with great reluctance, will tell him how to defeat the Kraken. Click here to view Bubo's somewhat less than dignified debut in the company of Perseus, when he unwarily perches upon a dead branch and unceremoniously crashes to the ground (Bubo, that is – not Perseus!). 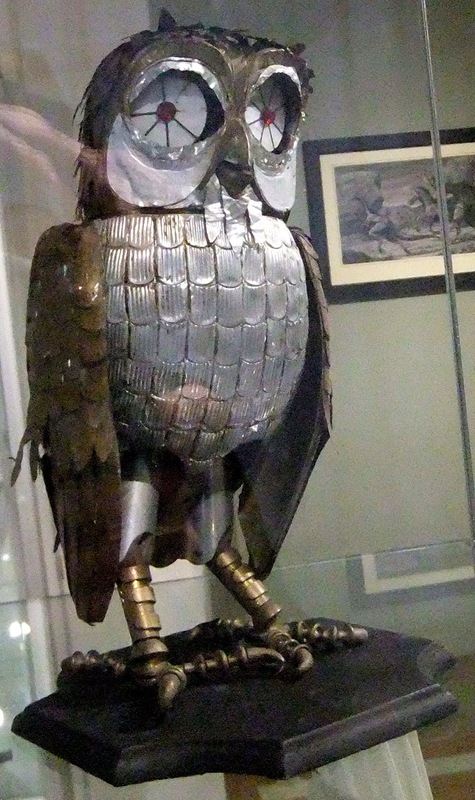 Ray's Bubo model was intricately constructed by him from golden and silver-coloured metal, and was radio-controlled when in the presence of the movie's actors and actresses – a dazzling cast list of thespians that include such celebrated stars of stage and screen as Sir Laurence Olivier (Zeus), Claire Bloom (Hera), Maggie Smith (the sea goddess Thetis), Ursula Andress (Aphrodite), Sian Phillips (Queen Cassiopeia), and the then still-upcoming actor Harry Hamlin as Perseus. The Stygian Witches inform Perseus that the Kraken can only be killed with the head of the gorgon Medusa, whose dreadful eyes even when dead would instantly turn to stone any living thing that gazed directly at them. So it becomes Perseus's quest to seek out and slay Medusa, but it will be no easy task, given that he can look at her only indirectly, via her mirrored reflection on the surface of his highly-polished shield. In the original Greek myth, Medusa was once an inordinately beautiful maiden before being transformed into her now-monstrous snake-haired, petrifying form by Athena after Medusa had been assaulted by Poseidon in Athena's temple, an act that the goddess deemed to be a defilement of her earthly abode (despite the fact that Medusa had been the innocent party!). Nevertheless, Medusa retains her comely body and lissom legs. Ray, however, considered that for her to be an effective on-screen monster, Medusa needed to be much more frightening in form, and so in the extremely detailed bronze model that he constructed he replaced her traditional human lower torso and legs with the limbless body of a giant serpent, and even added at the tip of its tail a large vibrating rattle as famously borne by rattlesnakes, as well as equipping her with a bow and quiver of deadly arrows to shoot at anyone entering her temple hideaway who was skilful enough to evade her lethal stare. Click here to view the nightmarish battle between Perseus and Medusa staged within the sinister torch-lit semi-darkness of the temple's silent, shadowy interior. And click here to read a ShukerNature article of mine concerning not only Medusa herself but also a host of real-life gorgon-dubbed creatures from the past and the present. Ray's ingenuity for improvisation and adaptation was by no means limited to his vision of how Medusa should appear on screen. Other notable examples include his two-headed roc in The 7th Voyage of Sinbad (1958) and his giant horn-skulled troglodyte in Sinbad and the Eye of the Tiger (1977). 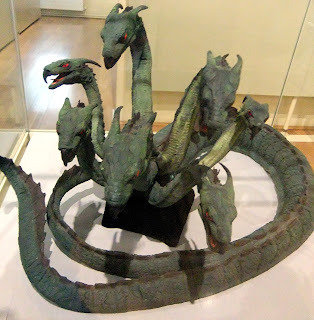 Moreover, in Jason and the Argonauts (1963), one of the Greek hero Jason's many monstrous antagonists encountered during his quest for the fabled Golden Fleece is the multi-headed hydra that in classical Greek mythology was actually confronted by Heracles instead, its eventual defeat being the second of his twelve great labours (click here for further details). In that latter legend, the hydra was generally described as nine-headed, but Ray considered that it would be too difficult to animate effectively nine independent heads and necks via Stop-Motion techniques, so he reduced its quota to seven. Possibly to compensate for this, however, he provided it with a bifurcated tail. In this movie, the hydra guards the tree upon which the glittering Golden Fleece is suspended, whereas in the original Greek myth it was guarded by a never-sleeping single-headed dragon as well as by a herd of brass-hoofed bulls that breathed fire and whose teeth if planted in the ground would transform into an army of soldiers. Ray skilfully utilised this latter characteristic, with the teeth of the hydra if planted in the ground transforming into an army of deathless fighting skeletons. Click here to view Jason's epic battle with the multi-headed hydra. And don’t forget to check out my Eclectarium blog article here concerning the history of another iconic monster from this same movie – Talos, the giant bronze statue that disconcertingly comes to life and relentlessly pursues Jason and his fellow Argonauts as they desperately strive to escape his lethal metallic clutches (click here to view this decidedly eerie scene). One of Ray's most celebrated accomplishments in Stop-Motion animation was undoubtedly his bringing to the screen those spectacular scenes featuring armies of fighting skeletons, raised up from the ground as deathless warriors to strike terror – as well as any weapons that they are brandishing! – into the hearts of their mortal opponents. They appear most famously in Jason and the Argonauts (1963), when King Aeëtes sows into the ground the teeth of the hydra newly slain by Jason; after Aeëtes then prays to Hecate, goddess of witchcraft, a company of seven weapon-armed living skeletons – 'the Children of Hydra's Teeth' – rises up out of the ground and furiously attacks Jason and two companions. After a prolonged battle in which both of his companions are killed by them, Jason successfully escapes their clutches by leaping into the sea where he is rescued by the Argonauts aboard their vessel. In his fascinating book, Film Fantasy Scrapbook (1981), in which he provided numerous behind-the-scenes recollections and inside information for each of his movies, Ray Harryhausen made the following very insightful comments concerning what he referred to as the Skeleton Sequence in Jason and the Argonauts: "Technically, it was unprecedented in the sphere of fantasy filming. When one pauses to contemplate that there were seven skeletons fighting three men, with each skeleton having five appendages to move in each frame of film, this means that an unprecedented 35 animated movements had to be synchronized with three live actors' movements; so one can readily see why it took four and a half months to record the sequence for the screen". Click here to view the fruits of Ray's Herculean labours in creating this extraordinary scene. In real life, Ceratosaurus was a theropod dinosaur from the Late Jurassic Period, approximately 150 million years ago. In Ray's British-made movie One Million Years BC, conversely, released in 1966, it co-exists with primitive cave-dwelling humans (including Loana, a very voluptuous cave-woman played by none other than Raquel Welch), as do many other officially long-vanished prehistoric beasts, such as pterosaurs, Brontosaurus, Allosaurus, and the gargantuan sea turtle Archelon. Yet although chronologically incongruous, as with all of Ray's movies the monsters are truly marvellous, but perhaps the single most memorable scene is a lengthy set-piece battle between a Ceratosaurus and a Triceratops, which the latter eventually wins, leaving behind the severely stunned but still breathing Ceratosaurus lying prone and gasping upon the ground. For increased dramatic effect, the Ceratosaurus is about twice as big as it would have been in real life. Click here to watch their gladiatorial conflict! In another extremely memorable scene from this same movie (click here to view it), Loana is abducted by a very big pterosaur, specifically a Pteranodon, carrying her aloft in its talons to its nest into which it is just about to drop her in order for its hungry offspring to devour her when it is itself attacked by another pterosaur, this time a giant Rhamphorhynchus. During the resulting mid-air melée between these two mighty flying reptiles (click here to view it), Loana is inadvertently dropped by her original abductor, falling wounded but still alive into the sea as the pterosaurs fly away, still locked together in mortal combat. 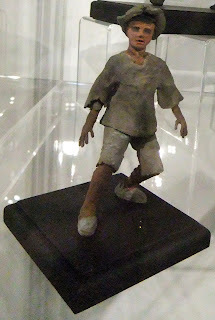 In addition to those of Ray, some models produced by Alan Friswell were also displayed in the exhibition. One of these was a Rhamphorhynchus pterosaur, which, as I have learnt from Alan, was one of his earliest Stop-Motion creations. Another, made by Alan about 15 years ago, was a very impressive Tenontosaurus – a herbivorous ornithopod dinosaur from the Early Cretaceous, related to (and also morphologically reminiscent of) the more famous Iguanodon, and which browsed upon ferns and shrubs. 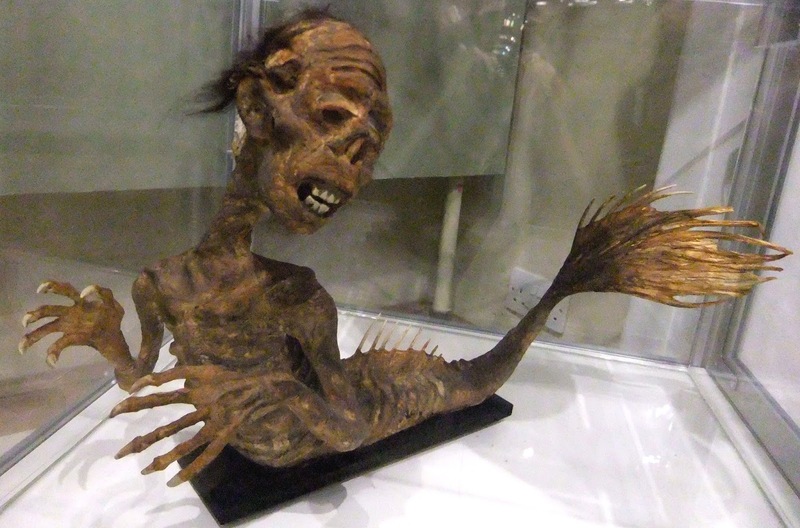 And a third model, one of Alan's specialities, was a superb full-sized Feejee mermaid. Also on display was a model of the boy Lope from The Valley of Gwangi, and which is of especial significance, because this was the model originally given by Ray to Alan to work upon as a test of his restoration skills, which in turn so impressed him that he duly gave Alan the position of official restorer of all of his models. Speaking of which: the very detailed, annulated shell of the earlier-mentioned giant ammonite/nautiloid mollusc on display here was actually made by Alan, upon Ray's request, because the original had been lost many years previously. So too had the Grand Lunar's crystal throne, and once more upon Ray's request Alan had manufactured a replacement, as well as creating a sturdier replica of Grand Lunar himself – and again it is actually Alan's versions of these latter two models that are on display, because although the original Grand Lunar still exists, it is far too fragile to be transported anywhere. Also present in the exhibition was a framed selection of Ray's original artworks, produced by him as preparatory and guide illustrations for various of his movies. Four of my favourite examples, seen here, show a cowboy chasing the Ornithomimus in The Valley of Gwangi; training El Diablo the Eohippus to be a circus performer in the same movie; an escaped Gwangi rampaging in the city; and Medusa confronting a couple of would-be slayers inside her temple hideaway from Clash of the Titans. 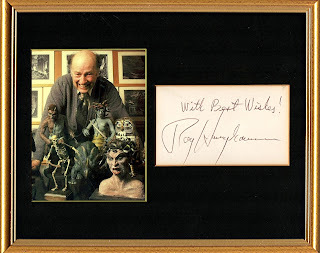 Many years ago, I was delighted to obtain Ray's autograph framed alongside a photograph of him posing with his Medusa model from Clash of the Titans. Never did I ever imagine that one day I too would be photographed alongside it. Truly an example, albeit a highly unexpected one for me, of the great Circle of Life? If you too are a fan of Ray Harryhausen and his exceptional contributions to the world of science fiction and fantasy cinema, you really do need to visit this awesome exhibition and see for yourself, as I did, some of his extraordinary creations that by virtue of his spellbinding Stop-Motion skills he was able to conjure forth in the living state on screen – a veritable magician of the movies, no less, infused with the power to resurrect dinosaurs, reanimate skeletons, and breathe tangible vitality into an entire menagerie of monsters that had never previously thrived outside the confines of human imagination. Click here to read coverage of this exhibition on the official website of The Ray & Diana Harryhausen Foundation. NB – Except for the Feejee mermaids and Alan Friswell's other models, all models and artworks depicted above in my photographs for this ShukerNature review article are © The Ray & Diana Harryhausen Foundation. About 15 years ago, I was most surprised but also very delighted to see – and purchase – at a movie memorabilia collector's fair held in England a sizeable plastic replica of the savage cyclopoid centaur created by Ray that battles Sinbad and also a griffin in the second of his three Sinbad-themed fantasy movies, The Golden Voyage of Sinbad (1973). Click here to watch this monumental battle. In addition, I've seen photographs of a splendid large-scale model of the winged homunculus from The Golden Voyage of Sinbad, as well as of an equally eye-catching one of the ymir, a giant reptilian alien life-form from 20 Million Miles to Earth (1957). Unfortunately, however, I've never seen any actual examples of either of these models anywhere. I am SQUEALING LIKE A LITTLE FANBOY at your picture of Gwangi. 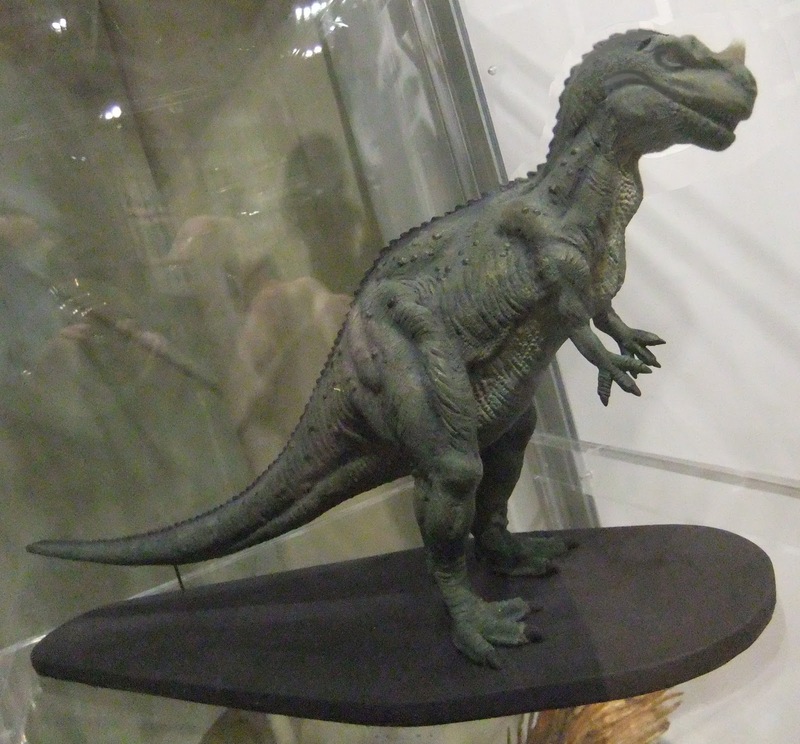 The other models are cool, too, but Gwangi remains something special. As a kid in the pre-VCR, three-channels-and-PBS seventies, I would stay up all hours whenever GWANGI came on TV. And speaking of distinctive touches, Gwangi's Elvis-style lip curl is one of the best. Thanks Karl. 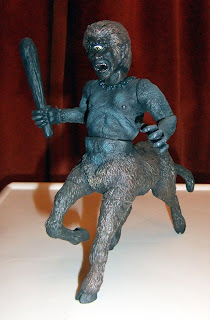 My favourite Harryhausen monster was Talos. That moment when the statue turns his head and looks at Hercules is super creepy. 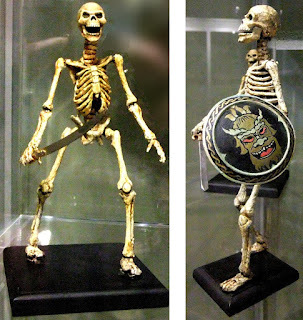 I consider the skeleton battle later in The Argonauts movie to be one of the greatest technical acheivements in cinematic history. How the hell he synchronised the live actors and model skeletons still astounds me!